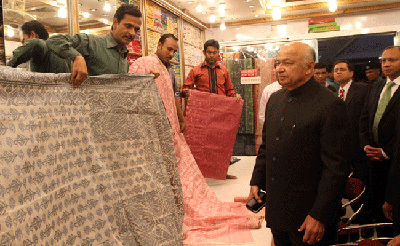 Honourable Indian Home Affairs Minister Sushil Kumar Sambhaji Rao Shinde compares Bashundhara Shopping mall with Europe or America in the city today. TIM Latiful Hossain, advisor of Bashundhara Group Chairman welcomed him with a floural bouquet. Besides Senior Advisor, A R Rashidi and Advisor Left. Crnel. (Retd.) Khandaker Abdul Wahed, Advisor Mejor (Retd. ), Md Mahbub Haidar Khan and many other officials were also present at the reception ceremony. Bashundhara is a very qualityful shopping mall as same as Europe and America. The combination of security system and management is very good in here. Different kinds of goods and items have under a roof which cannot see in this country. I feel comfort for shopping in here as same as foreign countries mall, he added. The minister came to the mall at 4.45 PM with Indian High Commissioner, Pankaj Swaran. He bought a trally suitcase from level 6 and 4 Jamdani Sharee from level 4. They also take snakes, coffee in level 8 and left at 5.45PM. The minister visited the mall for second time. In 2012 he came here with his family which is very favourite to all of them.